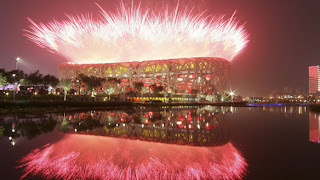 The Bird's Nest is the stadium where the spectacular opening ceremony of the Beijing Olympics 2008 took place. Here is an image of the Stadium as it dazzles with the great and magnificent fireworks display never before seen in the history of Olympics. After a dazzling show that put China on display to the world and a parade featuring a record number of athlete delegations, the Games of the 29th Olympiad were officially opened Friday with the lighting of the Olympic flame at the Beijing National Stadium. The ceremony kicked off with equal-parts pyrotechnics and power, as some of the 29,000 fireworks lit up the main route to the Olympic Stadium.